Hurricane Sandy blew through New York city this week, giving us different insights in the make-up of technology and how a single catastrophe can be broken into different models. Here are some observations on the week that went by. The single biggest symbol for the week was probably water, creating a goldilock-like breakdown to the hurricane zones: there were the people who had too much water (flooding), the people who didn’t have enough water (running water outages as a side effect of power being shut down), and those who had just the right amount (ie. anyone north of 40th street in Manhattan). In Manhattan, the contrasts were almost surreal. On one side, you had people bailing water out of basements by hand with buckets, hoping to salvage the foundations of their buildings and anything that had been stored away (for many restaurants, the recovery will be substantially longer, if it doesn’t kill them, as many restaurant kitchens are in basements). Meanwhile, people in the electricity-free zone, were sent scurrying for electrical outlets to recharge cell phones and computers, or looking for water so they could have something to drink or use to flush bathroom toilets (a note for future planning: large gallon-bottles of vinegar are also a great thing in terms of keeping bathrooms clean). At its most basic level were the people sitting without a roof, having lost their home either to flooding or wind. Those are the people the most affected by the storm as they do not have protection from the elements and, as temperatures go down, the basic need for protection increases. In many parts of New Jersey, Staten Island, and Long Island, people are still left in this state. At the next level is running water. One fails to realize how important water is until it no longer is available. While it is possible to go without showers for a few days, the hygiene of bathrooms dictates that toilets be flushed every so often, lest they become festering pools. Because New York is largely built upwards, water is generally pumped from the ground to water towers on the top of buildings. Those pumps operate on a combination of gravity and electricity (water can be pushed through pressure in pipes about 3-4 floors up in a building but beyond that, electrical assistance is needed). For many areas where power shut down, the inconvenience of having to use candles or battery-operated lights was trumped by the concerns over getting water up several floors. The next challenge was electricity. This was one of the more reported-about portion, as large parts of Manhattan went dark, dividing the city into power-haves and power have-nots. Along the way, it also gave New Yorkers a better understanding of the power grid geography, and led to some great acts of altruism as those with powers on the edges of the neighborhoods without power left extension cords outside their shops for people to recharge. Unfortunately, the further you got from the epicenter, the less people appeared to care, presenting a sad statement on the cohesiveness of friendliness that can exist in disasters. Beyond electricity, the availability of information was another prized possession that made the way: knowing who was open and selling water or other basic necessities or where the nearest electrical recharge point or bathroom was located were part of the new currency in the power-free zone. Going beyond that and having reports as to what other areas were affected and when electricity might be restored gave people glimpses of hope or a relative sense of well-being compared to people less fortunate. Once again, there was a surreal feeling in moving from the power-free zone of the city to the one with electricity as commerce and business ran as if nothing had happened. For example, I was in the mid-20s on 5th Avenue looking for a place to recharge when I saw that the west side of the street was fully powered: the net result was that people on one side of the avenue were doing expensive clothes shopping, while the sidewalk on the other side was mostly deserted, with closed up and boarded up shops still in place. On the upper west side, people complained over well-lit meals in restaurants about having to miss certain Broadway shows, an inconvenience that most south of 40th street would be happy to have to worry about. In the same way, much is being said about the power of the internet and technology to help when it comes to disaster. One thing that appears to be missing in the pundits’ assessments of how this would work is the basic fact that where electricity fails, the internet and phone infrastructure collapse. Many years ago, the telephone system use to run electricity on its own cables and thus plain old telephone lines could still function even if power wasn’t available. Phones back then could even work off the limited amount of juice that came down those lines. But as the infrastructure added new services and phones started to move over IP or wireless networks, a lot of that advantage disappeared. This week, in the power-free zone of Manhattan, a 30-year-old phone with a traditional copper line was a prized good. Meanwhile, cell towers started failing shortly have their back-up batteries went out and the ability to communicate went along with it. One of the interesting challenges the internet industry should look into is that very power issue. Is it possible to run power over coaxial cable or other connectivity in other to make the internet more reliable as a network. 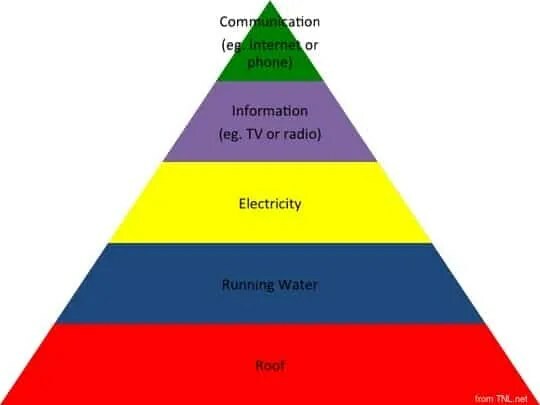 Until this very basic element is put in place, any other idea about how the internet can help in times of disasters seem to be more of a pie in the sky as bringing tools to damaged areas would pre-assume access in those areas (an amusing aside, as I sit here typing this is that while electricity and running water have been restored in my neighborhood, I will probably not get internet access at home or at my office until middle of next week). As both New York City mayor Michael Bloomberg and New York State governor Andrew Cuomo have pointed out, this was the second major weather-related disaster in as many years for the area. This means that treating it as an exception rather than a rule may no longer make sense. But the challenge of preparing a city like New York, which has always relied on its access to the water as a key asset, for the 21st century challenge of rising waters and extreme weather will be a costly effort requiring much ingenuity. Financial figures in the tens of billions of dollars have been thrown around and are probably on the low side of what it may take to bring New York into this new age. But here, New York could benefit from a long hard look at history. It’s a well known fact that New York is one of the best example of man’s attempt to bend nature to its will. Whether one looks at the New York grid (and its ability to remain a grid thanks to one of the most massive terraforming and land relocation projects in history), the expansion of the city on top of rubble from WW2 (filling in piers on the east river and in the Hudson with rubble from Europe that was used to weight down returning boats), the creation of Battery Park City on top of landfill created by the excavation of the World Trade Center, or the creation of the Eerie Canal, which gave New York a new lease on life in the early 1800s, the history of New York has always been about how to alter the land to deal with the city’s growing expansion. In parallel, that history has also been one where business and government interest have been aligned, with business generally funding some of the greatest projects in the city: the New York Subway and Eerie canal were funded privately, with government money being used as a loan and repaid later. And a new infrastructure for New York could follow a similar model. For example, a proposed Storm surge barrier had an estimated cost of $7 billion. If we are to assume some costs over-run, we could see this costing around $10 billion. Assuming the federal government would approve a 10 years loan to the city to build this, it would mean $1 billion a year. That seems like a lot of money until you think about the size of the New York population: with 8 million people living in New York city itself (and another 20 million people living in the greater NY area), you could be looking at $125 per person per year, or roughly $11 per person per month. All of a sudden, that number doesn’t seem so big. We could double it and add more projects to the development of the city. But how would the city go about collecting such a number? One possible way would be through taxation, adding an “emergency planning tax” to levy the money. Another way would be to take the money from insurance company, who would be among the greatest beneficiaries of such offerings as it would ensure they do not have to pay as much out in insurances (insurance costs for this week’s incident alone are already estimated at 10-20 billion). The only question that remains is whether companies and government have the will to go back to people and tell them that these are necessary costs to ensure the future of New York.